The High School Women’s team had senior night on 10/4/11. With a young squad, there was only one senior recognized – Cassandra Wruck. Cat’s been on the team for two years. She transitioned to being a diver this season, in addition to swimming. She’s already learned 11 dives and hopes to dive 250 or better at the Conference Meet so she can dive at Regionals. Cat has been a great asset to the team and to the dive squad as she juggles band, work, and swimming! Congrats Cat! 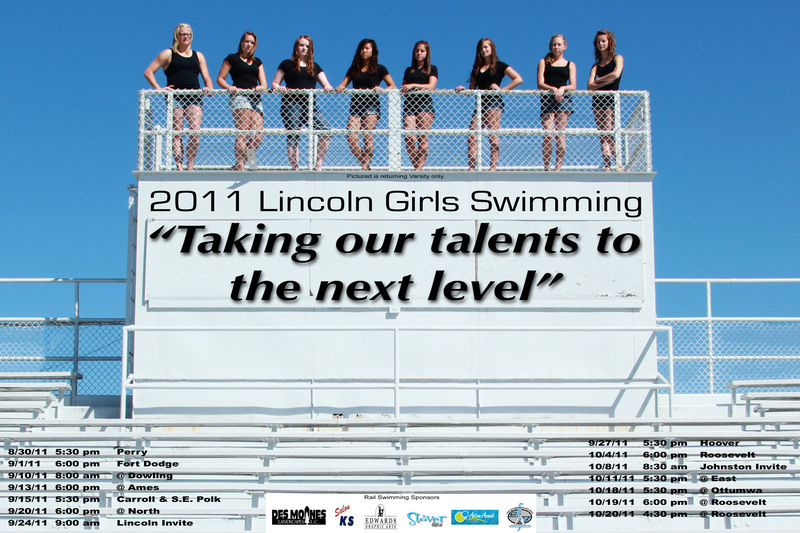 Up next: The Rails swim at East on 10/11/11 at 5:30 p.m. The Rails are hoping shooting for seed times in several events, as the team decides what events and relays are loaded for Regionals. We hope to see you there! *Note: This image is the 2011 Team Poster. For the Women’s team, only returning Varsity swimmers are pictured.